Analise Kandasammy: I am Analise Kandasammy, a social entrepreneur with a caring heart, strategist, change maker, team player, sports lover, arts enthusiast and an avid bookworm. I am originally from Guyana, but I now reside in Trinidad and Tobago. In both countries, my mix is known as a "dougla." AK: I started to embrace my curls about two years ago, when I realized there were products out there that were meant for me! As any curly girl would tell you, it’s easier to pass the bar exam than find the products which are just suited for your hair type. I went to NYC, and my aunt (who is also a curly girl) saw all the products that I was then using in my hair. She was horrified and threw all of them into the trash. True story! She immediately started handing me bottles of Mixed Chicks, Ouidad and Carol’s Daughter. I experimented with the various products and then found a combination that worked for me. Now different products work depending on whether I am in a temperate or tropical climate, but that is another test in itself! AK: Every morning, I wet my hair, even if it's just to dampen it, and then apply product. I don't use too much product because it weighs my hair down. Most mornings I use a dollop of the Mixed Chicks Deep Conditioner. I comb it through my hair and then scrunch to style. I've found the only gel which doesn't strip my hair is Pantene Curly Hair Series Gel — I use about two dollops of this to define my curls. On days when my hair frizzes a bit and needs definition, I use Jane Carter Solutions Curl Defining Cream. When I have enough product but my hair looks like it has lost its sheen and gets frizzy, I use Ouidad Botanical Boost — three sprays, scrunching, and I'm ready to go! AK: The Mixed Chicks Paddle Brush is fantastic! It combs through my hair so easily and I’m not forever tugging at knots. And ever since I found Mixed Chicks Shampoo and Conditioner, it is part of my "can’t do without" hair routine. The Ouidad Botanical Boost is a must to revive my hair at the end of the work week. AK: I just LOVE to have my hair open and blowing in the wind! It feels most natural this way. Sometimes I pull two strands back and clip them up. AK: Finding the right hair stylist who embraced thick curly hair was a struggle. I would be recommended to hair stylist after hair stylist whose best solution for my hair type was either to "relax it" or to "use Matrix." I refused to do either of the procedures, because to me, it wasn’t helping me find a solution to manage my curly hair. They were essentially telling me the only way to manage my hair was to change its texture. 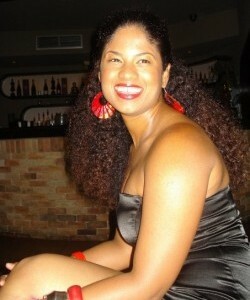 I was fortunate that my friend, another curly girl, recommended that I try her hair stylist, Dana. When I first went to her, I was skeptical given my past experiences. But she threw all of my apprehension out of the door when she asked me, "Are you happy with your thickness and length?” I said yes, and that was it! She went to work and my hair looked fab! What I love the most about Dana is that she is all about healthy hair — all of her recommendations are based on that foundation. 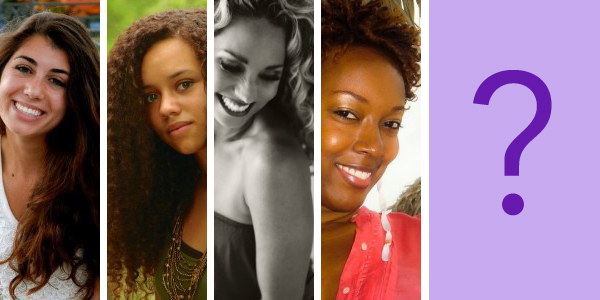 MORE: Find a Curly Hair Stylist Near You! NC: Did you ever have any insecurities about your curly hair? AK: I had insecurities about my hair for most of my life. In fact, I’ve only started to embrace my curls for the past two years of my life. Apart from my impatience to manage it when I was a teenager, it was mostly the comments I received from people when I was in my late teens and early 20s that really made me feel like something was wrong with my hair. My hair is really thick, and I’d always get comments like, “Oh my gosh! Your hair is so big. Why don’t you straighten it?” Or “Why don’t you relax your hair?” Granted I do have a full head of hair, but what is wrong with that, right? 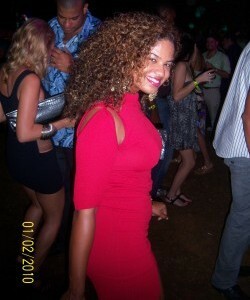 AK: Being curly is an aspect of my mixed heritage. I love displaying that for the world to see! AK: I try to convince ladies that their hair can be managed with the discovery of the right products and that they just haven’t found their precise combination of products yet! Then I recommend that they see my hair stylist Dana, who will give them the right advice on how to manage their hair. Sometimes I actively help them research products and give them accounts of other women’s experience if their curly hair is different from mine. AK: I am the Co-Founder of The Backpack Project which is a non-profit initiative aimed at promoting health and education among Caribbean students from low income families between the ages of 5 - 18. I am also a member of Soroptimist International Newtown, Trinidad (part of Soroptimist International, Great Britain and Ireland network). We are a worldwide service organization, working to transform the lives of women and girls through education and leadership. Who would you like to see in Real Texture Talk? Tell us by commenting below.